The majestic Rocky Mountains, the wide-open prairies, and the clear winding rivers make Montana a vacation wonderland. The state's colorful human and natural history, touching on everything from Lewis and Clark to paleontology to Old West mines and mining towns, is the subject of many attractions that appeal to visitors from around the world. Often referred to as "Big Sky Country," Montana is spread across over 147,000 miles but is one of the least populated states in the United States. For travelers looking for stunning vistas, untouched natural parks, and to get away from the crowds, Montana should be a top pick destination. Glacier National Park is famous for its jagged snow-capped peaks, glacier-carved valleys, serene lakes, rushing rivers, and abundant wildlife. And, yes, even a handful of glaciers remain. A popular way to experience Glacier National Park is by traveling the Going-to-the-Sun Road, a steep, windy, amazingly scenic route. To enhance the experience, visitors will find grand historic lodges and recreation options that range from easy to challenging. Lewis and Clark and the Corps of Discovery found their way to many points in Montana, both when traveling westward seeking the Pacific Ocean, and when returning back to the East. Paddling or walking parts of the same route is a thrilling way to experience and appreciate their historic accomplishment. There are several Montana road trips you can take themed around Lewis and Clark attractions and activities. The Lewis and Clark National Historic Trail Interpretive Center, located in Great Falls, is a highlight, with a nice selection of significant sites nearby. This Montana Historical Society Museum in Helena, also known as Montana's Museum, is filled with interesting artifacts from the state's past and present. The museum's Mackay Gallery of Russell Art houses a fine collection of paintings, sculpture, and illustrated letters by prominent American artist Charles M. Russell. The "Montana Homeland" exhibit provides a timeline of interesting objects that take you through all phases of Montana history. Special and traveling exhibits change over time, covering topics that touch on the history of Montana and the region. The Gates of the Mountains, a gorgeous canyon on the Missouri River, can be enjoyed on a fascinating boat tour available 20 miles north of Helena. Interesting geology and varied wildlife, including birds of prey, can be seen throughout the trip. Gates of the Mountain was named by Merriwether Lewis in July 1805 during the Corps expedition; you'll find out why on the tour. You'll also stop at the entrance to Mann Gulch, site of a tragic 1949 wildfire that is the subject of several books. The area is officially the Gates of the Mountain Wilderness Area, administered as part of Helena National Forest. Boating, camping, hiking, and picnicking are among the available recreation activities. The Upper Missouri Breaks is a unique stretch of the Missouri River that passes through remote and rugged canyons. Many folks take multi-day canoe trips on the Upper Missouri National Wild and Scenic River, which passes through the monument, enjoying the same scenery and wildlife experienced by Lewis and Clark. The official Upper Missouri Breaks National Monument Interpretive Center is located in the small historic town of Fort Benton. Experts at this center can fill you in on all the details you need to explore the Upper Missouri Breaks by land or water, whether you plan to take a guided trip, or your own boat or canoe. While at the Upper Missouri Breaks National Monument Visitor Center you can learn about the natural and human history of the region. Hiking, birdwatching, fishing, and camping are all available. Charles M. Russell is one of America's great cowboy artists, capturing accurate and compelling images of the West, covering its days as a wild frontier into the era of homesteading and settlement. The C. M. Russell Museum Complex in Great Falls includes not only 15 galleries, but the original Russell home and the artist's Log Cabin Studio. Highlights from the Museum's permanent collection include hundreds of Russell paintings and sculptures, a selection of illustrated letters, and the Browning Firearms Collection. The Studio also contains an exhibit of artifacts from Russell's personal collection. Also known as the Beartooth All-American Road, this scenic drive covers about 70 miles, passing through the rugged Beartooth Mountain Range in both Montana and Wyoming. The route follows US Highway 212 from Red Lodge, MT, in the east, to the Cooke City entrance to Yellowstone National Park at the west. Along the way, there are numerous places to stop and take in the stunning mountain views, whether from a scenic overlook, on a hike, or during a picnic. You'll also find clear lakes, waterfalls, a fire lookout tower, a general store, and, in autumn, colorful foliage. The Beartooth Highway is considered one of the most beautiful scenic drives in the US. The natural and human history of the amazing Rocky Mountain region is the focus at Bozeman's Museum of the Rockies. Montana's rich body of dinosaur fossils and knowledge, represented at the museum, is worth a visit on its own. But there's more! Other exhibits cover aspects of Montana's human history, including Native Americans, mining history, and transportation. The Museum of the Rockies has a lot to stimulate young minds; the new "Explore Yellowstone" exhibit in the Martin Children's Discovery Center does an awesome job of introducing little ones to the animals, geology, and outdoor recreation opportunities to be found in Yellowstone National Park. A planetarium, living history farm, and traveling exhibits are other fun things to check out while at the Museum of the Rockies. Located within Lewis & Clark Caverns State Park, the stalactites, stalagmites, and other interesting mineral formations in Lewis & Clark Caverns can be experienced on a guided tour. It starts at the tour center, located about two miles into the park. You'll start your tour with a leisurely 3/4-mile walk up a switchback trail to the cavern entrance. Inside the caverns, you'll spend much of the tour going down narrow, winding, often low-ceilinged stairways, with frequent stops to check out interesting cave features. Throughout the cave interior, your guide will provide the story behind the Lewis & Clark Caverns, both in solid facts and entertaining fabrications. Once you leave the caverns, you'll have an easy 1/2-mile walk back to the tour center, restrooms, cafe, and gift shop. Located an hour east of Billings, right off of I-90, the Little Bighorn Battlefield National Monument preserves the site where the famous Battle of the Little Bighorn took place on June 25-26, 1876. Stop first at the visitor center, where you can view an orientation film, check out exhibits and the bookstore, and find out about ways to explore the monument in greater depth. Then head out on a ranger-led or self-guided tour. 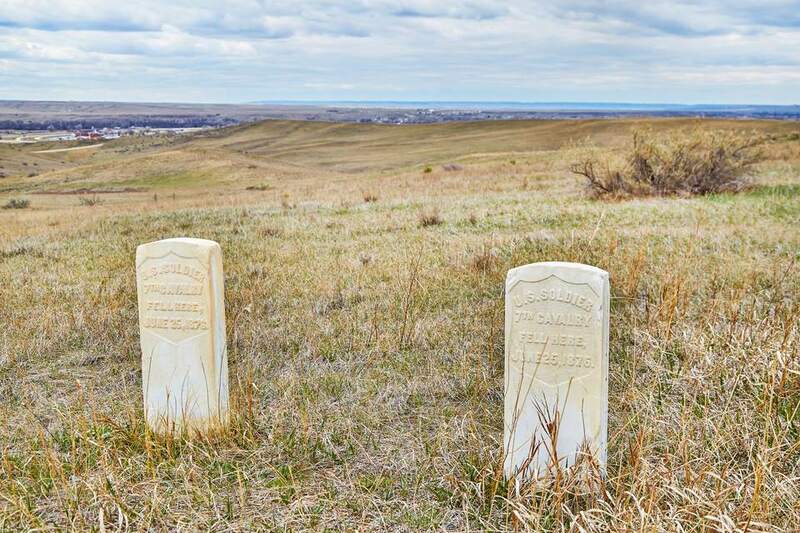 Allow plenty of time for a walking tour of the monument to see sites such as the Last Stand Hill, the Custer National Cemetery, and Indian Memorial. Then drive to the nearby Reno-Benteen Battlefield site, stopping at marked spots along the way to listen to background on the location available via podcast.